Deep Fried S’mores are an irresistible treat that’s golden and fluffy, melting in your mouth. The s’mores made the traditional way with graham crackers, chocolate and marshmallows before being dipped in a homemade batter and deep fried to perfection. 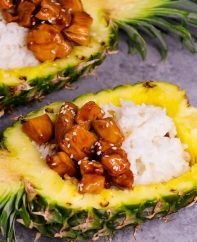 Perfect for a party or midnight snack. Plus video tutorial! 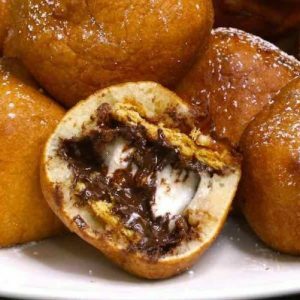 Deep Fried S’mores are one of those cray desserts you have to taste at least once! It could be our all-time favorite s’mores treat, inspired by our Deep Fried Cookie Dough and Deep Fried Cheesecake recipes. These party-perfect treats feature graham cracker, marshmallow and melty chocolate wrapped in a puffy batter and dusted with powdered sugar. 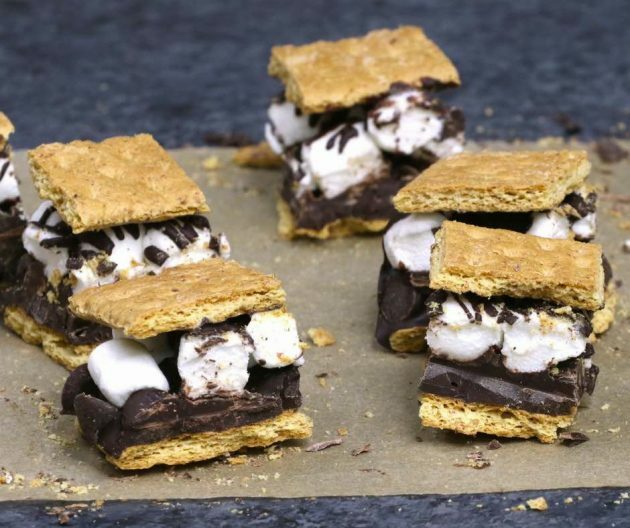 So if the weather’s too cool for campfires and you still need s’mores in your life, look no further than this recipe for complete satisfaction. 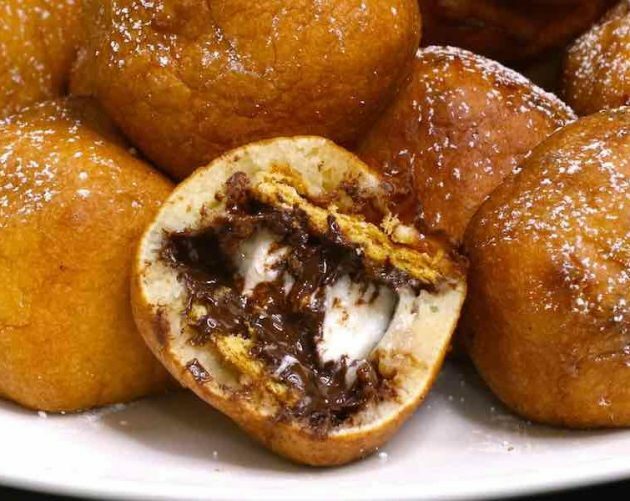 Deep fried smores originated as State Fair concoctions, but haven’t really been made at home … until now. 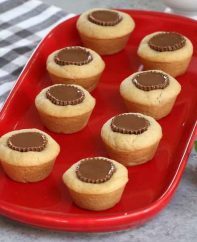 In this recipe, we’ve adapted them into golden pouffy balls that melt in your mouth with gooey s’mores flavors on the inside. There’s a bit of dedication required to make deep fried s’mores. We often sacrifice the first few balls to get the hang of it, and then the rest come along more easily. The first step is to take a square 8-inch pan and line with parchment paper. Then you can place graham crackers in the bottom. Chill for ten minutes, and then cut them into about 36 inch-size squares. You may be wondering how square pieces become round balls, and the battering process that follows is the secret. Using a simple pancake batter, either homemade in this recipe or using a packaged mix, dip the s’more pieces in one-by-one and fry them for about a minute in 400°F oil. Repeat the process until all the pieces have been deep fried. Deep Fried S’mores – OMG seriously one of the most delicious desserts! Smores dipped in homemade batter, and fried to a fluffy, golden crispy ball with a warm and melty chocolate chips and marshmallow inside. A great dessert for a party. 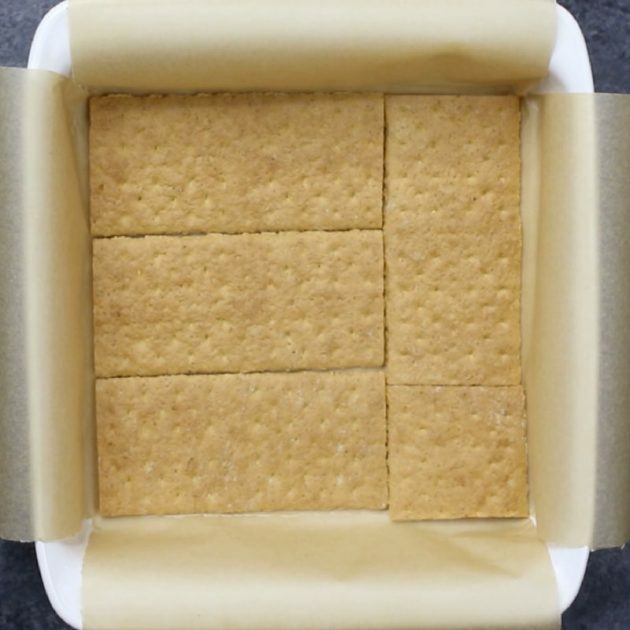 Arrange graham crackers to cover the bottom of the pan, breaking up sheets as needed to fit. Place 1 cup of chocolate chips in a bowl and microwave in 30 second intervals until smooth, stirring in between. Drizzle 1/3 of the melted chocolate onto the graham crackers, followed by the remaining chocolate chips, followed by 1/3 more melted chocolate, followed by the marshmallows, and finally the remaining melted chocolate. Top with a layer of graham crackers according to the video, and place the pan in the refrigerator for 10 minutes. Meanwhile, make the batter. In a medium saucepan or deep fryer, add vegetable oil and set temperature to 425°F. In a separate bowl, mix the flour, sugar, baking powder and salt. Pour in the wet ingredients and whisk until smooth. To get ready for frying, line a large plate with paper towel and set aside. Also get tongs and a slotted spoon. Remove the s'mores from the fridge. 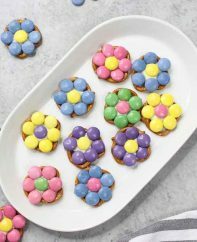 Lift them out of the pan and onto a work surface using the parchment paper. 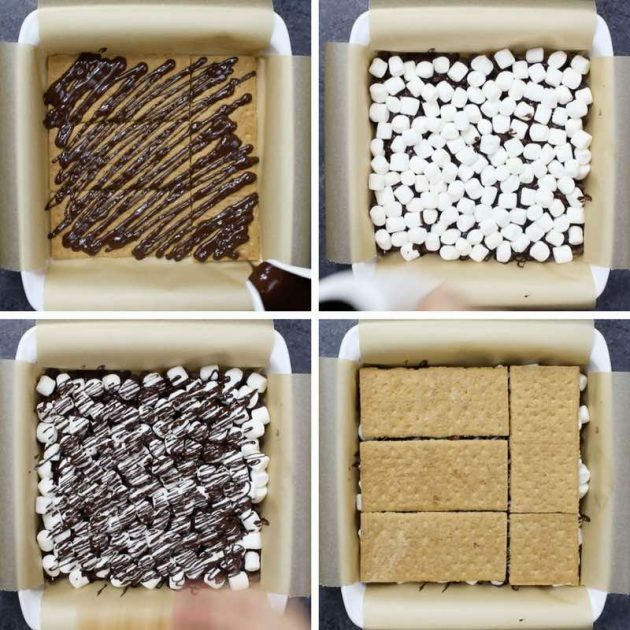 Using a sharp knife, cut the s'mores into 6x6 grid to make 36 pieces. If any pieces break, use melted chocolate to glue them back together. Drop a s’mores piece into the batter and using the tongs coat completely. Then lift the coated s'more out and let excess batter drip off. 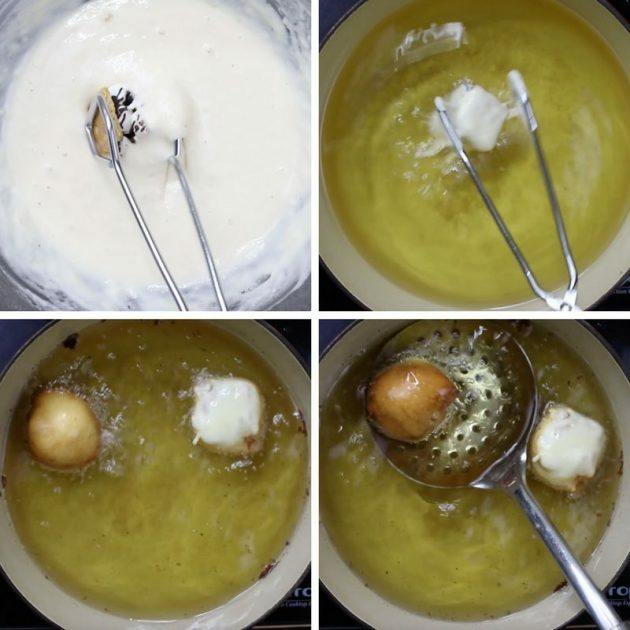 Place the s'more into the hot oil, and fry for about 1 minute until it has puffed into a ball and turned golden brown. Remove to the prepared plate. Dust with optional powdered sugar. Serve warm and enjoy! -Instead of making homemade batter, you can use dry pancake mix and add water according to the package directions. -Keep the s'mores in the fridge until ready to fry, especially if the weather is warm. Should I use semi-sweet or milk chocolate chips? Either is fine but you might find milk chocolate too sweet. Enjoy! Delicious but how do I get the melted choc chips to drizzle……when I melted the chips they were way to thick to drizzle…. you could also try a double boiler and butter. you basically put hot water in a pot and a bowl on top, you just have to make sure the bowl is heat resistant. Why chocolate chips instead of chocolate bars? And how do you cut them without the graham cracker breaking into Shards? Hi Briauna, Thanks for your question. You can use 8 oz baking chocolate instead of the chocolate chips. You can cut through the graham crackers with a sharp knife. There may be a few shards, but it’s ok otherwise. Hope that helps! Could you use Graham cracker crumbs instead? Hi Laura, Thanks fo your question. You need graham cracker sheets, as the crumbs won’t hold together during deep frying. Hope that helps and enjoy! 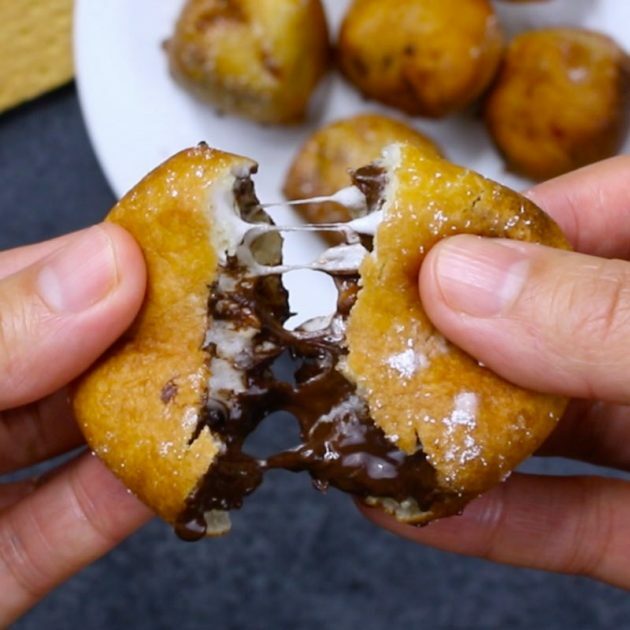 could i use just chocolate syrup instead of melting the chips for drizzle? Does it have to be an 8in pan? !